Quite a few years ago we gave up our sensible jobs in the city (as designer & accountant) to pursue a dream of living and working in Italy. We are passionate about preserving the environment, locally grown food and embracing a slower pace of life. We spent several very long years painstakingly restoring our abandoned 17th century farmstead and even longer resurrecting, clearing and re-planting the 20 acres of surrounding olive groves and abandoned countryside. We opened our home to visitors since 2007 – after many years of hard work we think we have created a beautiful, environmentally respectful place to celebrate holidays and enjoy family time together. We are passionate about three things here at Pian di Cascina; Food, responsible tourism and family time together. We enjoy putting a smile on the face of every single family who visit us here in Italy. Feast is our favourite word! We nothing love nothing more than sitting down with family and enjoying a really good alfresco feast. Food is so much tastier shared with loved ones outside in the sunshine, knowing that you are feeding them something natural, nutritious and delicious. Here at Pian Di Cascina we pride ourselves in growing as much as we can organically and bringing this to you from farm to table in the most natural way possible. We enjoy sharing our love of food and good wine, along with promoting delicious local produce with our guests during our sociable restaurant nights at La Tavernetta. Responsible Tourism – as parents we are acutely aware that any damage done to the environment will impact on our children and their future. We aim to limit the impact we have on this stunning part of the world by educating our staff, recycling, reusing and sourcing ethical materials and products wherever possible. We considered the whole site from an ecological point of view from the start to ensure that we preserve as many resources as we can. We are passionate about being part of something that brings a smile to the faces of so many families – helping people to have a good time and a good holiday is our motivation – it’s so much more than a job to us! 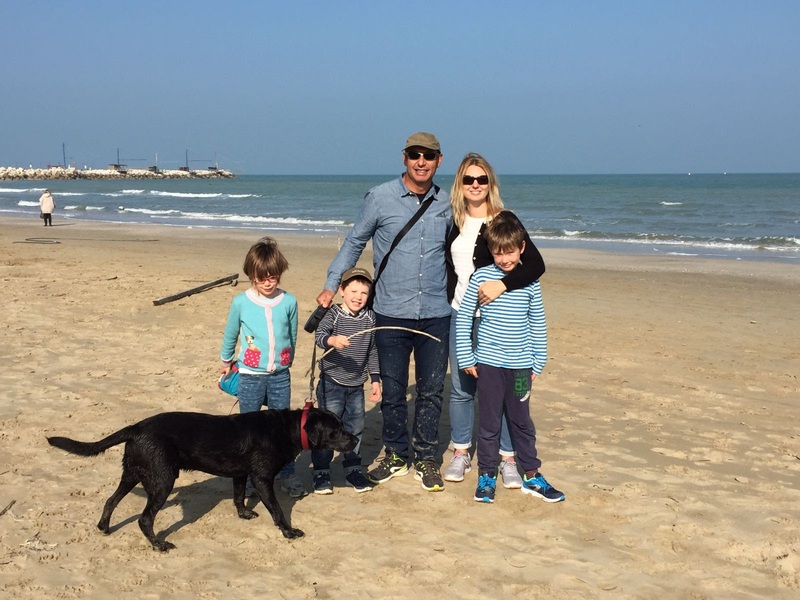 We are now lucky enough to be living the Italian dream here with our 3 children, our lovely black Labrador, Ollie, our crazy chocolate one Charlie Brown & our friendly flock of chickens, Charlie, Lola, Lulu, Beaky and Flappy…we hope to be able to welcome you here one day soon. Our holiday homes have been individually designed and built by us with you mind to ensure you get the best comfort, best views and very best experience of the location. We combine ethically sourced materials, period pieces, modern designs and local art & craft to create relaxed, comfortable and inspiring spaces for you to enjoy. Villa Pian Di Cascina holiday rental in Umbria is an 20 acre farm estate with a traditional hand built Umbrian stone farmhouse that dates back 400 years to the 17th century. The farm is surrounded by stunning views and uninterrupted countryside that has changed little over the years. Pian Di Cascina is the original name of the farm and means ‘farm on the plain’. The farmstead, is located on the saddle of the hillside, called Caresto. Our farmstead is illustrated on ancient maps stored in the Vatican in Rome and has historical importance. At the top of Caresto, there is an abandoned church and castle, now in ruins. According to local families, our farm provided provisions to the castle for pilgrims and travellers, lodging at the castle on their way to Assisi. Local history indicates that the original pilgrim way to Assisi passed through the land on our farm, and pilgrims would have rested for the night at the castle. We are just one days walk from Assisi – we would have been the last stop on a long journey for many. When we first ploughed the raspberry field – we did in fact find obvious remains of an old stone road/track that may well have been this very pilgrim trail. Local people also tell us that during medieval times – when the town of Casacastalda was invaded, the towns people would escape through hidden tunnels into the countryside and head for refuge at the castle of Caresto. Some of the elders of the local villages remember walking past our Villa Pian Di Cascina, when they were children to visit relatives who at that time lived at the castle. Villa Pian Di Cascina villa rental Umbria – why not stay here in our 400 year old farmhouse – visit Umbria – and the green heart of Italy will win your heart!